Influenza medication includes antiviral drugs prescribed for the treatment of influenza. Influenza, also known as flu, is a respiratory disease caused by an influenza virus. It is a viral infectious disease that includes three major types: type A, type B, and type C. The common symptoms of the disorder are cold, cough, fever, and sore throat, which can be severe or mild. Seasonal outbreak of influenza primarily occurs in winter. Most people generally recover fully, but severe complications such as pneumonia can also develop. Initiation of antiviral treatment is recommended for hospitalized influenza patients. 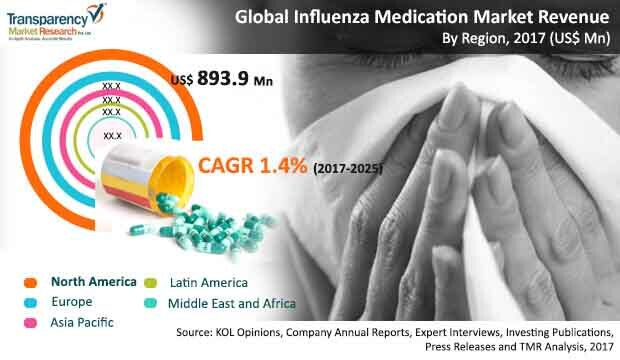 High growth of the global influenza medication market is due to unmet medical needs within the annual influenza epidemics along with strong R&D focus resulting in new and advanced treatments and drugs, and increasing demand due to government stockpiling. The global influenza medications market has been classified on the basis of three categories, which are by product, distribution channel, and geography (regions & countries). The product category is further sub segmented into zanamivir, oseltamivir, peramivir, amantadine, rimantadine, inosine and others including laninamivir octanoate. Of these, oseltamivir held lead with a share of 48.8% in the global market in 2016. The rising use of oseltamivir in the treatment of flu triggered by H1N1 virus and prophylaxis is one of the key reasons behind the segment’s lead. In term of distribution channels, global influenza medications market is divided into hospitals, clinics, pharmacies and others. Incidence and prevalence of flu are gradually increasing across the globe. Of these, the pharmacies segment held dominance in 2016. Through the course of the forecast period, growth run witnessed by the segment is likely to remain steady due to the mushrooming pharmacy stores around the world. Besides this, the market is likely to witness lucrative prospects in the hospitals segment. For instance, According to the CDC, around 5% to 20% of the population is affected with the flu in the U.S. each year. Additionally, an estimated 200,000 people are hospitalized due to flu infection in the U.S. each year; of these 36,000 die due to flu complications. Favorable policies for treatment and prevention of influenza by the government in developed regions. These are the major drivers in the growth of influenza medication market. The market in Asia Pacific is expected to expand at a high CAGR of 1.8% during the forecast period due to availability of low cost treatment and availability of better health care facilities. Patent expiry of key drugs and entry of generics and Side effects of anti-influenza drug therapy are the major restraining factors affecting Influenza medication market. By geography, global Influenza medication market has been segmented into major five regions: North America, Europe, Asia Pacific, Latin America and Middle East & Africa. In 2016, North America and Europe accounted for the largest share of the Influenza medication market followed by Asia, Latin America, and Middle East & Africa. The U.S. dominated the Influenza medication market in North America, accounting for around 49.8% share in 2016. North America leads the global market with a major contribution of the U.S. owing to increasing adoption of advanced and high-cost drug therapies, increased treatment rate, and favorable reimbursement policies in the country. Europe and Asia Pacific are projected to be moderately lucrative markets from 2017 to 2025. Increase in the number of public awareness programs for prevention and diagnosis of chronic diseases such as influenza has significantly reduced the prevalence of influenza in Europe. In Europe, demand for influenza medication products is the maximum, with a major share held by the inosine product segment. Asia Pacific is expected to dominate the global market, due to major contribution from developing countries. China and India are highly populated countries with the maximum number of influenza patients making them major contributor to the growth of the market in Asia Pacific. The key players operating in the global influenza medications market are Daiichi Sankyo Company, GlaxoSmithKline plc, Natco Pharma, F. Hoffmann-La Roche Ltd., Teva Pharmaceutical Industries Ltd., Sandoz International GmbH (Novartis AG), Sun Pharmaceutical Industries Ltd. and Mylan, Inc. The global Influenza medication market is dominated only by few players that operates in global market.